Each publication is either relevant, useful and timely information for future and young parents or unique channel for communication that is focused on the target audience. 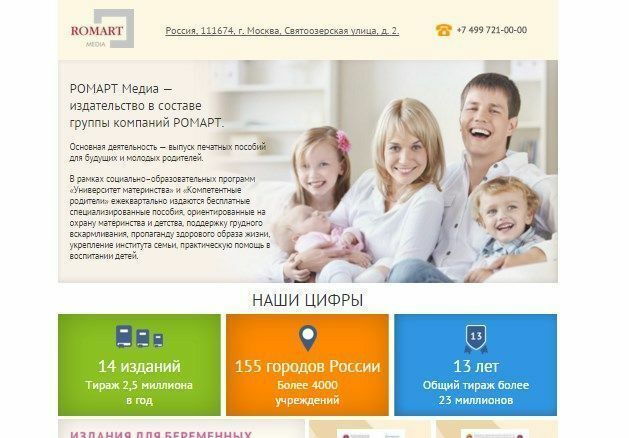 Posobie.info - social network for future and young mothers. Posobie.info is much more than a general information site, it is the parental Internet community uniting all who are interested in such aspects of our life as like being a parent, motherhood, family life, child care, parenting. Here any future and young mother can create unique virtual home of her family - tell about herself and her relatives, upload photos, keep a diary, participate in competitions and sweepstakes, post reviews of medical and child care centers, find other users with common interests for communication, discusion of current issues and experience exchange. Socio-educational program in the field of maternity and childhood "University of motherhood"